Identity theft attracts fraudsters because they can steal significant amounts with extreme anonymity, and victims and law enforcement can seldom pursue them. 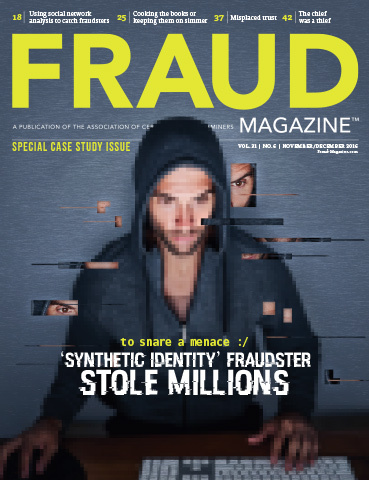 However, the authors describe an investigation that yielded the arrest and prosecution of a fraudster who used “synthetic identity theft” and other crimes to steal millions. Learn about their practical methods and a stunning twist. Corporate management has significant latitude in choosing what numbers to report and when. But business pressures can cloud their judgment. This article examines how using accounting gimmicks and manipulating financial statements might satisfy investors but can cross into fraudulent territory. What tears at the fabric of a small town? Theft, betrayal and a loss of confidence in the very institutions that make the town a great place to live. This is the story of how a small gap became a gaping hole in oversight, management and internal controls, which resulted in a theft of more than $250,000. The financial problems of church council members John Osborn and Mary Meyers motivated them to steal the church’s endowment funds. Here’s how the couple exploited their position of trust within the congregation to commit this devastating fraud.